Beginning with the 2006 vintage, Luc & Jodie Morlet have been handcrafting vineyard designated wines and unique cuvees. Meticulously farmed vineyards and low-intervention winemaking techniques produce powerful yet refined wines. 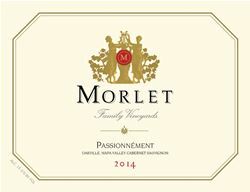 By taking old world principles and adapting them to California, the Morlet style results in wines which are harmonious in their intensity, richness, complexity and refinement. At Morlet Family Winery, you will be treated to a tour of our historic facility and a tasting of six of our wines. Tours and tastings are available on a limited basis by prior appointment only. Priority is given to active members of our Mailing List. For non-members, a $100 per person tasting fee is waived when six or more bottles per couple (three or more bottles per person) are purchased at the conclusion of your visit. Please visit our website to learn how to schedule a tasting at our winery.